Good friends of ours recently moved much closer to us and we are so excited! I can’t wait to see their place! So I made this card to welcome them. 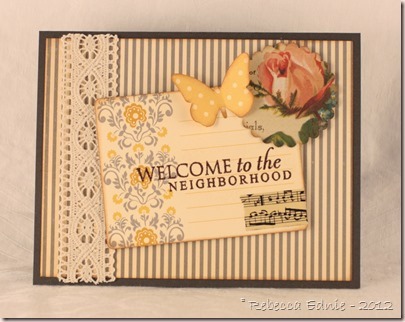 Most of the card is October Afternoon but the sentiment and card base are PTI. I used cinnamon to scent my brown EP but honestly, even though I used much less than the 2:1 ratio recommended, I found my sentiment was only partly embossed, most of the powder blew away. So I carefully stamped over again and re-embossed it. Now it looks good but I have no idea if it will scratch and sniff. I wasn’t taking any chances before I photographed it! I tried using my tea stained lace but I really didn’t like the colour it turned. Kinda weird. I hope I can manage to use it up somehow.